Specialist examinations and bespoke eye wear. At Zacks London Eye Clinic our optometrists can provide advice on Myopia Control and the best options for treatment. Myopia typically develops between six and thirteen years of age and progresses fastest in younger years before stabilising in early adulthood. Several factors play a role in the development of myopia including binocular vision status, family history, ethnicity and environment. The chances of developing myopia are 3x higher when one parent is myopic and 7x higher when both parents are myopic. Light exposure is also thought to have a profound impact. Myopia progression increases in winter months and has much higher prevalence in urban settings, especially in children who spend more time indoors and perform more near work. The prevalence of visual impairment rapidly rises with increasing myopia, especially in old age. Even low myopia significantly increases the risks of cataract, glaucoma, retinal detachment and macular degeneration. Myopia greater than -6.00D is termed pathological myopia because at that level the odds of developing several eye diseases are greatly increased. Slowing down the progression of myopia will significantly reduce the chance of developing high myopia and therefore greatly reduce the risk of visual impairment in later life. Before commencing myopia control a thorough eye examination is essential paying careful attention to how the eyes focus at near. A cycloplegic refraction and binocular vision assessment are also often required along with scans of the front of the eyes to consider suitability for orthokeratology and contact lens wear. 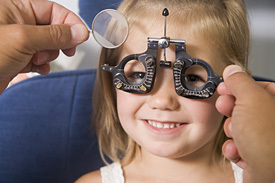 Our optometrists will then be able to guide you through the best myopia control options. Please note myopia control treatment is elective and there is currently no government approved formula for treatment. Increased outdoor activity, regardless of the type of activity, has been shown to be protective against development of myopia, along with low to moderate levels of near work. Children should of course be encouraged to read and do their school work, but to balance this by reducing other leisure activities involving near tasks, and ensure more time is spent outdoors (ideally 3 hours per day). Progressive lenses including bifocals and multifocals (often called varifocals) are beneficial in certain circumstances, when myopia progression is accompanied by difficulty focussing and aligning the eyes for near tasks. In these cases myopia progression may be reduced by up to 50% whereas in other cases they have little benefit. Orthokeratology treatment, also known as overnight vision correction involves wearing specially designed rigid gas permeable contact lenses to gently alter the shape of the cornea to correct myopia. The aim is to be free of both glasses and contact lenses during the day. Orthokeratology is very effective for myopia control and several studies indicate a reduction in myopia progression of 45%. Monthly disposable multifocal soft contact lenses are available in a wide range of prescriptions and can be tailor made to almost any size and shape. Recent studies show that certain lens designs, although not designed for myopia control, can reduce myopia progression by 30-50%. MiSight daily disposable contact lenses for myopia control have shown very promising results. A recent study (by the manufacturer) shows 59% reduction in progression of myopia over a 3 year period. Medication such as Atropine (0.01%), used mainly in Singapore and China, can be extremely effective. However, these drugs are not licenced for use in the UK and are not available. If you are concerned about your / your child’s progressive myopia please get in touch to make an appointment at our central London practice. For more detailed information for eye care professionals, there is an excellent article here, written for Optometrists on the Association of Optometrists Website. Site design by Opake Ltd.
Click the above image to download a £50 OFF printable voucher which can be redeemed against a complete pair of spectacles purchased in store before the 31st December 2016.